Kings of the Mountain: A shower at last! 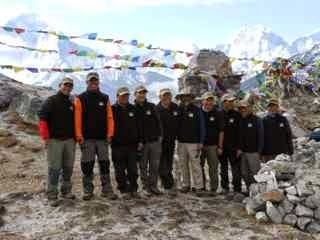 For the last 12 days, we have been woken up at 6:00 am by the Sherpas, knocking on our doors and presenting tea. Moments later they arrive with a small basin of warm water. In this water we have to wash up, brush our teeth, and possibly shave. That is all we get. The facilities are very basic. The toilets may either be squat toilets (holes in the ground) or western toilets with no flush. We have to pour in water from a large bucket to flush the waste down. We cannot drink or use the tap water to brush with. Consequently we are using lots of hand sanitizers. Showers are very hard to come by. Sometimes we can buy a hot shower, but it may either be outside or a bucket of hot water that we use to shower with. Overall though, we did well with the basic facilities. Finally today we had an in-roon shower. It felt incredible after 12 days! We are clean and happy. We just had dinner and we are learning about knots and carrying techniques for injured people in the backcountry. PS the picture above presents our Sherpa.